Today we started our day at an iconic breakfast spot situated next to the lower ninth ward, ground zero for hurricane Katrina. We walked into Penny’s cafe and I immediately felt the rich fly fishing history. It seemed like every other table was filled with a guide and clients. I went to the bathroom and framed on each side of the door was a photo of the Drake magazine in which an article on Penny’s cafe was featured, and on the other side, a picture of barely the spine of the roof showing during the devastating hurricane. We had the regular, eggs, biscuit, breakfast potatoes, and sausage patties. With a good cup of that local chicory coffee I was ready for the day ahead. We made a stop for beer and gasoline then the usual hour drive to the put in. When we got there and started rigging up most people were turning around. It didn’t look like the weather was all that bad and we had made it this far already. It was windy and I could see from Jim’s attitude that it was not supposed to be a good day. Eventually we found a quiet cove with an oyster shoal which added protection from the wind. This spot had quite a current as it was situated close to the Mississippi River. So we decided to sit and have a beer, and enjoy the wind block and sunshine for a minute. Then the most amazing thing happened. There were bottlenose dolphins all around us smashing bait, and beaching these little mullet, it looked like something from a planet earth episode. I jumped on shore to have a closer look. I was focused on the dolphins trying to get a photo and something caught my eye. 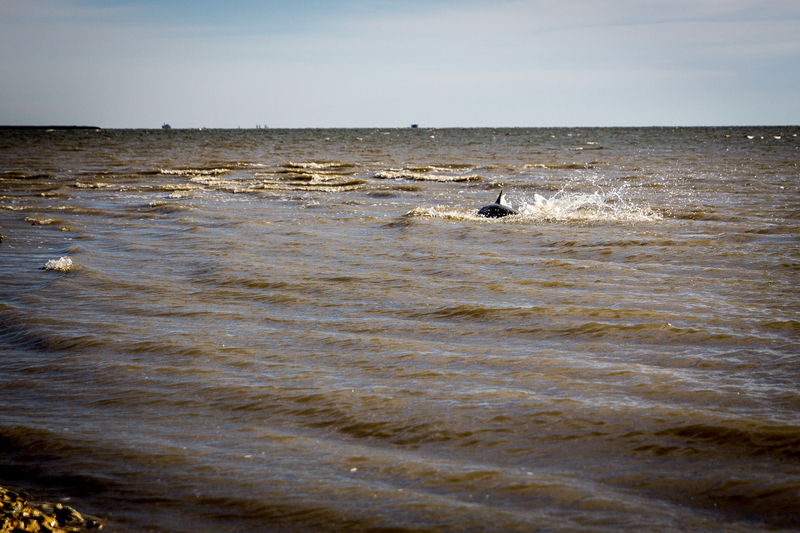 At first I didn’t think anything of it as the dolphins were sometimes coming a few feet from me. I started to watch this spot a few feet from shore. 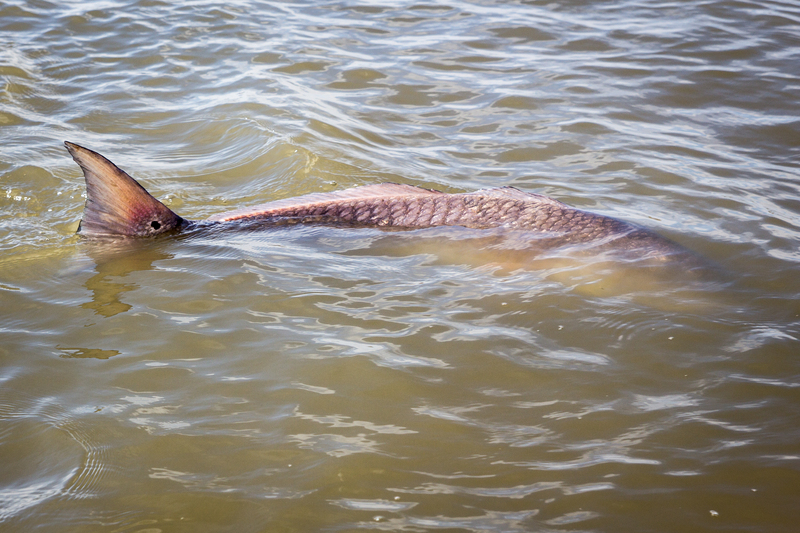 There was movement happening under the surface and I thought fur sure it was a redfish. It was hard to tell as the wind was kicking up the waves and it was a nasty day, but I walked back to the boat and grabbed my rod anyway. 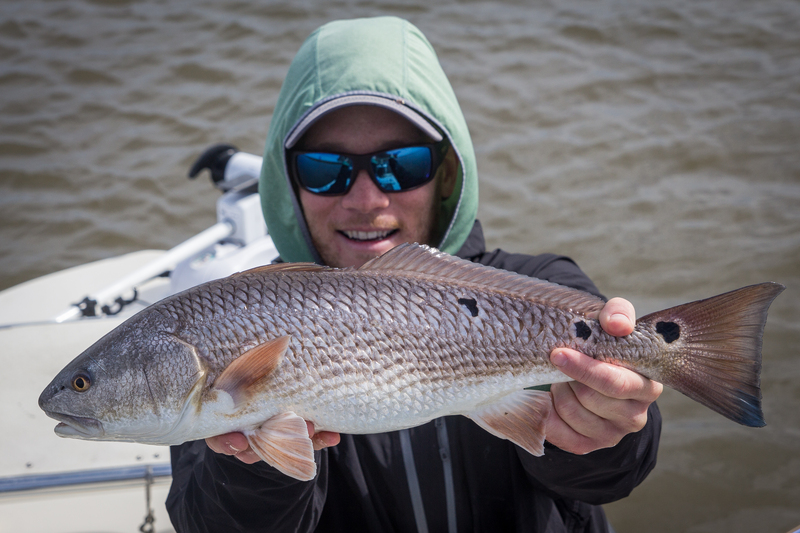 I started casting into that spot and all of the sudden a big push of water came at me and I knew what had happened, the redfish lunged at my fly and missed. Jim was next to me and we both flipped out. Jim was in full guide mode now and told me to recast. 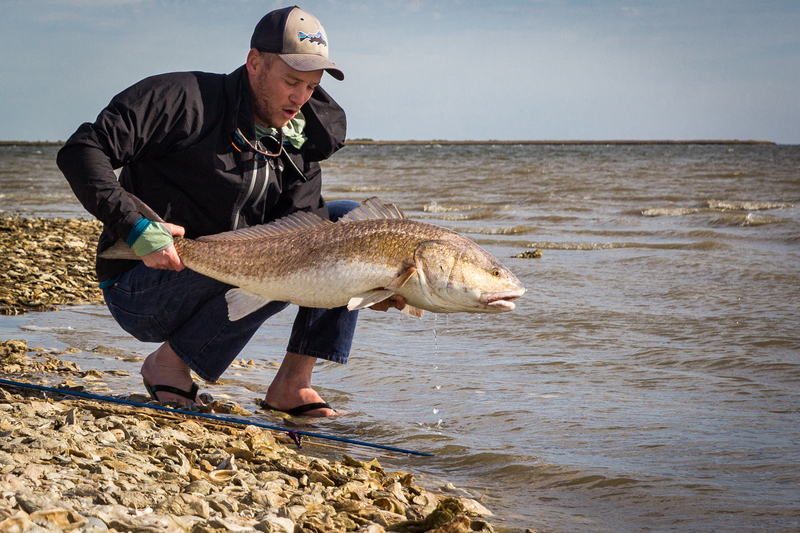 I casted again and nothing happened and I was really worried I had blown my chance at what looked like a 25 LB redfish. Seconds later I saw another swirl of water 10 feet past my fly so I picked up once and re casted, this time shooting the line. 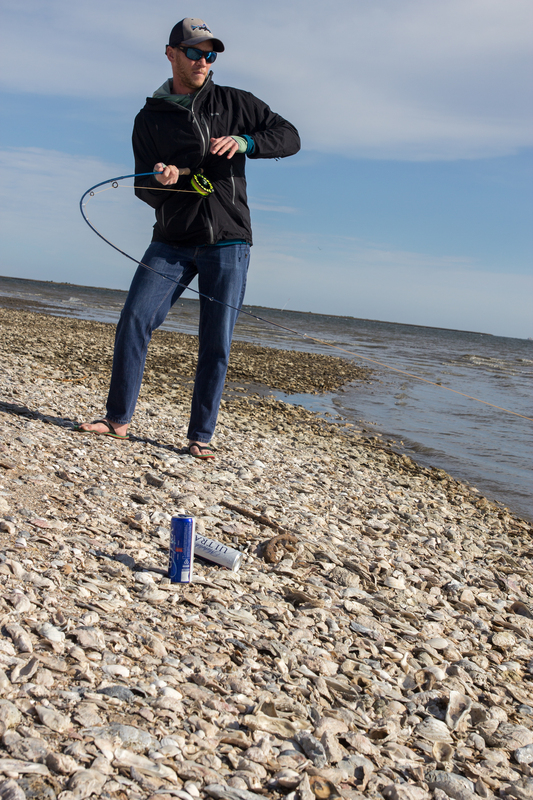 I kept my rod tip low, stripped slowly and felt an incredible weight on my line. 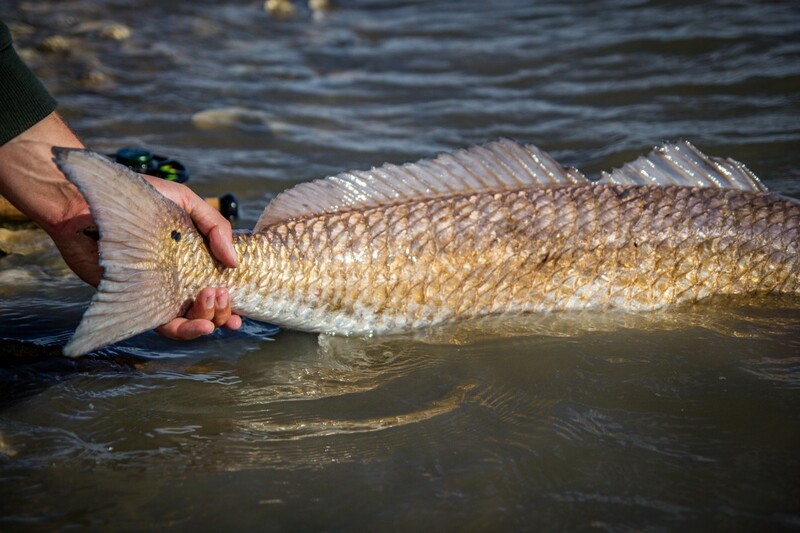 It felt like I was shaking hands with god as the redfish gave a few head shakes and took off for the middle of the channel. I was truly freaking out and couldn’t contain my excitement and Jim was too. He grabbed the camera and started taking pictures as I was doing battle with this beast. I hadn’t seen him yet but knew there was a lot of weight at the end of my line. It was truly one of the top five fly fishing moments of my life. Eventually after about 20 mins this fish surfaced. I was so nervous I was going to loose it but knew it would make a great story either way. After a few more head shakes I was able to walk backwards and beach it. Thats when I started yelling and shouting and jumping and hugging Jim. We couldn’t believe what was happening. Jim said that was the only fish he has ever seen caught from the shore in Louisiana. Not to mention I did it on a day when everyone else was turning back. 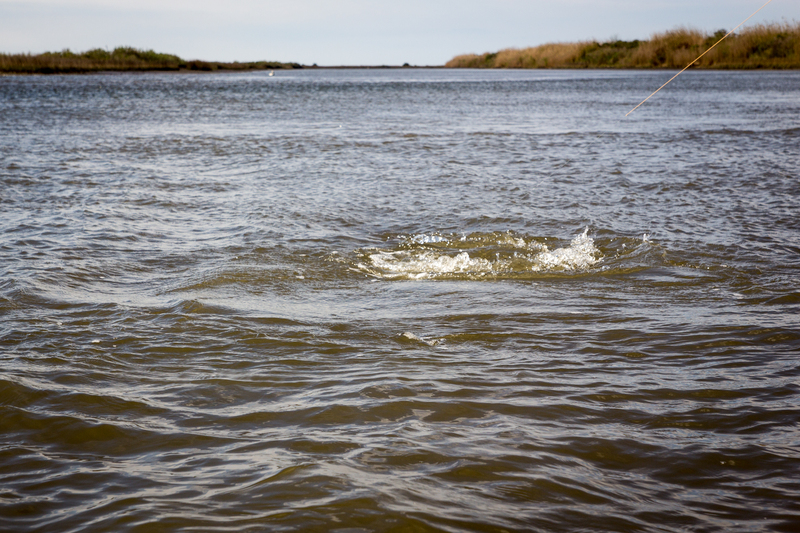 After taking a few photos Jim and I watched this fish swim quietly back in to the dark Louisiana marsh. I had to sit down for a while and finish my beer as that was total insanity. It just proves the point that you never know what you’ll get into until you get into it. And that memories can be made when the odds are stacked against you. 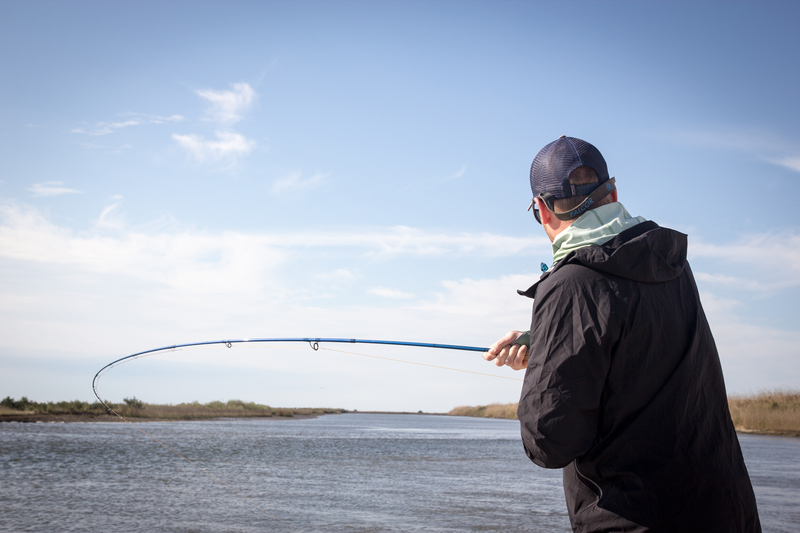 I can guarantee I caught the biggest redfish in all of Louisiana that day because of tenacity and Jim’s superb guiding skills. You have to be a ninja to really learn the marsh like him and I can guarantee I would have put the boat into a sandbar trying to navigate the endless channels of the backcountry. After lunch the wind had laid down just enough for us to explore a couple channels and ponds. 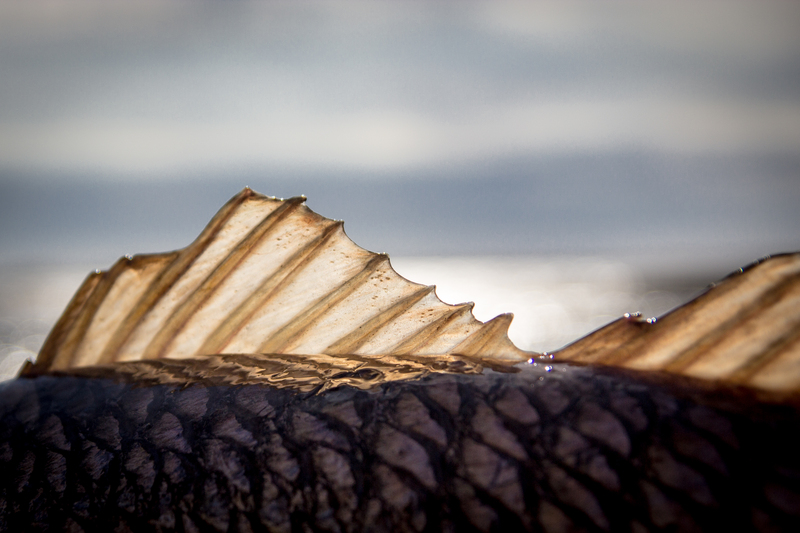 We got to the leeward side of one pond and started seeing redfish all over the place. This was the nursery though so I had fun catching a few beautiful smaller reds, but the visuals are all the same. We called it a day early as there are always chores to do when you get home. 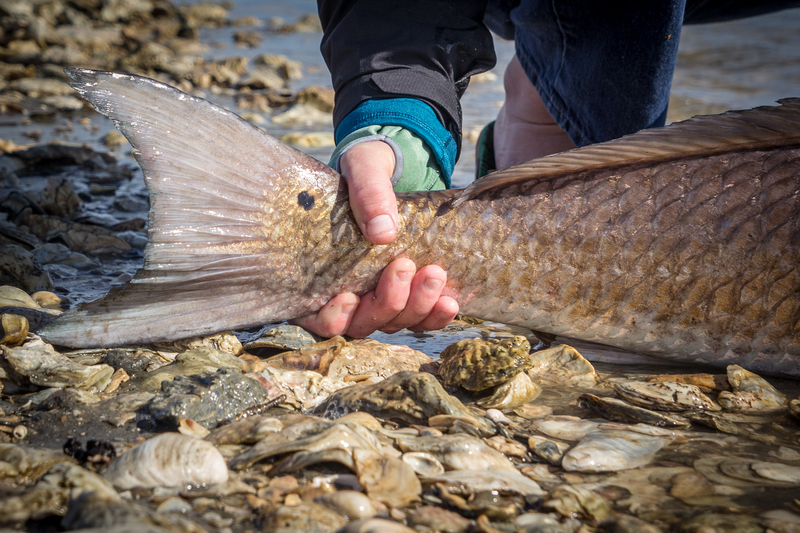 It had been a successful day on the marsh so we trailered up the boat, stopped at the car wash, dropped the boat at redfish camp or, “Little Florida,” grabbed daiquiris to go and went home to have a redfish feast. I would like to thank Capt. Jim Dietz of Mountains to Marshes for hosting me during such an incredible few days in New Orleans! More stories from our week together to come! Great read. Sounds like another great memory. Dude. Yes! I’m frothing. What do ya think, 6 more weeks until Jackson is firing again?